HANOI, Vietnam, March 22, 2019 /PRNewswire/ — Syntonic, a leading mobile technologies and services provider, today announced that MobiFone Telecommunications Corporation (“MobiFone”), one of the leading mobile operators in Vietnam, has launched its new mobifoneGo service, built entirely on Syntonic’s Revenue Generation Platform to capture new app-economy revenue streams. mobifoneGo offers consumers unlimited access to popular apps for a fixed daily or monthly fee. The new mobifoneGo service represents the first deployment of the newly-expanded Syntonic Revenue Generation platform, which now enhances its mobile advertising services with mobile commerce and content monetization capabilities. Syntonic has created the only unified platform for acquiring, engaging and monetizing a mobile audience throughout the entire customer journey. Initially, the mobifoneGo service will support content subscription bundles with unlimited access for a fixed fee. Future services will integrate sponsored data and data rewards that engage and reward customers for specific actions, paid for by advertisers and content providers. 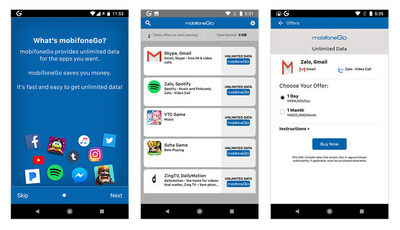 mobifoneGo will launch with 16 “app bundles,” including popular apps such as WhatsApp, Gmail, Grab, Skype, and Spotify, which can be purchased in either daily or monthly subscription packages. With a subscription, consumers have unlimited online access to their apps, which does not count against their data plan. The mobifone app is now available in the Google Play Store and coming soon to the App Store. Established in 1993, MobiFone was the first mobile operator in Vietnam and currently serves nearly 50 million subscribers. Syntonic (ASX: SYT) unlocks the value of mobile data. Operators worldwide use Syntonic’s easy-to-deploy Revenue Generation Platform to capture new revenue streams from mobile data and the app economy. Syntonic’s award-winning software, services, and support span mobile advertising, content monetization, and online commerce, enabling mobile carriers, app publishers, content providers and advertisers to engage their audience and customers throughout the entire lifecycle. Learn more at www.syntonic.com.